Jon Bernthal (AMC’s The Walking Dead, The Wolf of Wall Street) will be rounding out the stellar cast of Baby Driver which already boasts the talents of rising star Ansel Elgort (The Divergent series), fellow fast-tracker Lily James (Pride and Prejudice and Zombies), two-time Oscar and Golden Globe winner Kevin Spacey (Netflix Original Series House of Cards), Oscar and Golden Globe winner Jamie Foxx (Annie), and two-time Golden Globe and Emmy winner Jon Hamm (AMC’s Mad Men). The news was first reported by Deadline. Written and directed by Edgar Wright (The World’s End), the story follows a crime kingpin named Doc (Spacey), who coerces a young, baby-faced talented getaway driver known as Baby (Elgort) to work for him and his revolving group of bank robbers. Baby credits his usual success to a specific music playlist, however this job does not go according to plan and the doomed heist threatens Baby’s life and freedom, not to mention his love interest, innocent Deborah (James). Doc’s team includes handsome partier Buddy (Hamm), Buddy’s shameless girlfriend, Darling (Eiza Gonzalez), and Bats (Foxx), an impulsive gun-toting guy. Bernthal is to play a character named Griff. Working Title principals Eric Fellner and Tim Bevan are producing with Nira Park through her Big Talk Productions. Executive producers are Adam Merims, Liza Chasin, Michelle Wright, and James Biddle. Leo Thompson will associate produce. Sony is set to distribute. 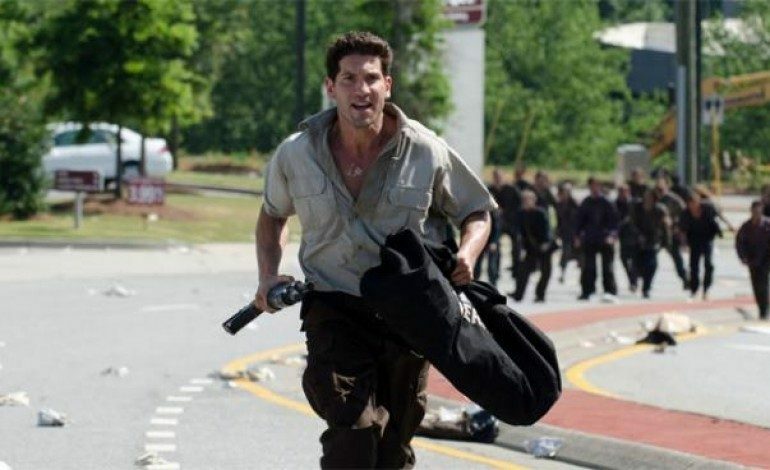 Bernthal, who was in 20 episodes of AMC’s hit series The Walking Dead, was recently seen in Denis Villeneuve’s Sicario starring Emily Blunt (Into the Woods), which received three Oscar nominations this year. Bernthal is set to make his debut as the Marvel Cinematic Universe’s Punisher next month with the return of Daredevil to Netflix. Bernthal be seen on the big screen next in Gavin O’Connor’s The Accountant starring Oscar winner Ben Affleck (Batman v Superman: Dawn of Justice), Oscar winner J.K. Simmons (Kung Fu Panda 3) and Anna Kendrick (Pitch Perfect franchise). Casting for Baby Driver is now complete and filming has just started in Atlanta. The feature from Working Title, Big Talk Productions, Media Rights Capital and TriStar Pictures is slated to open March 17, 2017.